Carretera Intl Km. 5 nte., 85010, Cd. Obregón, Sonora, Mx. 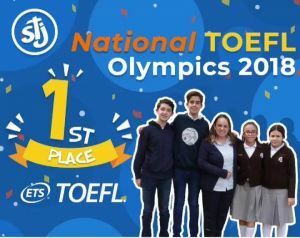 Four of our students obtained the 1st place in the National TOEFL Olympics. Mayela Rizo Borquez and Maria Elena Romo Dosamantes had a perfect score and placed 1st in the TOEFL Primary, Francisco Olea Gandara and Jesus Ramón Zazueta also had perfect scored and placed 1st in the TOEFL Junior. They have been invited to attend a special recognition ceremony at the Benjamin Franklin Library of the USA Embassy in Mexico City. They will attend this event this Friday November 30th accompanied by Maria Trapero Davila our English Department Coordinator. Congratulations for this important achievement!!! !